Shalom Hartman Institute of North America is proud to present a diverse range of faculty from both North America and Israel, representing the best of both traditional and academic learning. Through their scholarship and teaching,our faculty advance pluralism and highlight the values and big ideas of Jewish tradition. Esteemed faculty members include published authors, respected researchers, university professors, and members of Israeli government. The Shalom Hartman Institute of North America’s educational staff are the backbone of our organization. These well-regarded educators, researchers, and thought leaders lecture, teach, and write on behalf of the Hartman Institute, as well as develop and oversee our North America programmatic work. 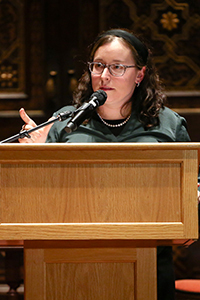 North American research fellows are scholars who collaborate on interdisciplinary research teams to generate ideas in response to urgent questions of modern Jewish life. Currently our North American research teams are exploring the Israel-Diaspora relationship, ethical Jewish leadership, Jewish identity, and modern Orthodoxy Jewish life. Fellows spend time researching and collaborating in residence at SHI North America New York offices. Our faculty are premier educators who teach and facilitate conversation on behalf of the Institute, drawing on the big ideas and curriculums developed by our research teams as well as on their own professional areas of expertise. David Hartman Center Fellows are emerging thought leaders and public intellectuals, either academics in the advanced doctoral or immediate post-doctoral stages or rabbis in the early stages of cutting edge rabbinates. The fellows learn how to apply their ongoing academic work or research to issues of contemporary importance and gain a deeper understanding of the evolving Jewish communal landscape. Shalom Hartman Institute of North America brings the best and brightest Israeli thinkers and cultural innovators into conversation with North American scholars and communities. Each year an expanded roster of diverse Israeli faculty lecture and teach in programs across North America.